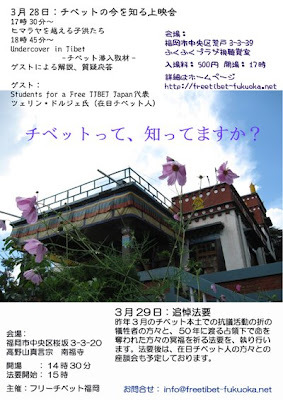 For a guilt-free Tibet experience in Fukuoka, you might like to join the two events being sponsored by Fukuoka Free Tibet over the 28-29 March weekend. This British television documentary first aired in spring 2008 and follows a young Tibetan, now naturalized British, who ventures into Tibet to talk with people the Chinese government would not like you to hear from, including victims of torture, sterilization, and forced resettlement. I reviewed this film last year here, including a link to Google films. Presumably the Fukuoka screening will include Japanese subtitles or narration. After the screening there will be a discussion with Tsering Dorje, Students for a Free Tibet Japan. This will be a short religious service commemorating the victims of 50 years of Chinese occupation of Tibet, followed by discussion with resident Tibetans. For more on these events, you can visit the Fukuoka Free Tibet website, through which you may contact the organizer in English.